Setting: a fantasy world with a culture loosely based on the late middle ages or early renaissance, with more value placed on the fantasy elements than strictly adhering to a proper "time period" (i.e., more World of Warcraft than Game of Thrones). Scenario: a group of adventurers happen upon a hidden cache that has been buried for ages. The biggest item catches their attention most. It's a nuclear bomb, but of course they'd have no way of knowing that. So they haul it to the University for study, where one of the smartest minds in the world vows to determine what it is. The question: how far would this person get? What would this person be able to determine about the device? I know there are different kinds of nuclear bombs, but I'm not smart enough to know which one to choose; pick the one that would be the "easiest" to crack, I suppose. As I said above, the time period is very loose. If nobody in the late middle ages or early renaissance could have figured it out, could somebody in, say, the wild west? As a last resort, what kind of aspects of these time periods would have to change to make this even remotely feasible? (They told you it can't be done. They're right. Realistically, it can't. So, disclaimer: I'm going to employ industrial quantities of high-grade Improbability). I had to play with "realize what this thing is". There's no reasonable way I can hand-wave an alchemist deducing nuclear fission. The best I think we can aim for is strongly suspect this thing was designed for, and capable of, flattening a city. And I had to conflate alchemical knowledge with sorcery and occult lore, to help explain why someone might decide to do some things in one way or another, or why jump to some very specific conclusions instead of others. In several places, the actual likely outcome is one dead alchemist. Most parts of a nuclear bomb are toxic, and several of those that aren't all that dangerous will become so once subjected to standard alchemical procedures. During examination of the explosive lens, for example, it's a safe bet that poisoning will happen, or at the very least the alchemist will find himself changed into a canary girl. And finally, the bomb was almost surely not functional before the examination, and will get messed up beyond all recognition by the disassembly. It may still poison a large area, but no mushroom explosion, ever. So the High Alchemist gets his hands on this strange object, incredibly heavy. He is scientifically minded, so he starts recording everything on vellum. The runes on the surface of the object, its size, its weight. How the various parts are put together. After a short time the alchemist concludes, so far, that the device is built up of two parts. One is a jumble of incredibly small components connected by colored wires, and put together every which way. There are several things resembling gems and precious metals in this part of the object, and they are carefully arranged to form what looks like the most complex amulet he's ever seen. Whatever this thing was designed to do, it must do so by channeling ridiculous amounts of magic. He very carefully pries the boards apart and gives them to an apprentice to record every printed circuit, every trace, every wire, and every object and rune on them. Several components appear to have decayed during the time, and are clearly unrecoverable. The second part of the object is a heavy sphere armored in steel. With care, the alchemist opens the shell. There are other shells inside. Whatever is inside must be really precious. The wires clearly demonstrate that something was intended to go from somewhere outside, along the precious copper cables, into the sphere. Magic, since the cables are not hollow. An egg? Could this thing be an Alchemical Egg? The alchemist goes on with bated breath and trembling hands. If this thing is really an Alchemical Egg, its weight has an obvious explanation. It has been already activated somehow, long ago, and a sizeable part of the mass has been transmuted into gold. But more than that, inside the sphere there must still be its key component - the petra philosophorum, the Philosopher's Stone. Carefully, he removes layer after layer. After a couple days' work, he is again puzzled. What is this thing? The inside could contain several dangerous elements; a residue of ignis aqua could easily contaminate his whole laboratory, and only a fool handles carelessly a potential alkahest hazard. Spirit of mercury is also a probable component, no less lethal than the first. Then, the apprentice reported a rune structure that's totally unknown; there's a very real possibility that the thing is demonically powered. The alchemist goes even more slowly, aware that one false move and he stands to lose his life, and/or his soul. So after warding everything twice and operating inside a defensive pentacle, the alchemist removes with some effort one frankincense-smeared wedge with several pounds of Composition B. Which looks nothing like spirit of mercury. It certainly isn't any sane ingredient an alchemist would recognize. What is it made of? However, the standard analysis procedure is pretty straightforward. The alchemist scoops a generous dollop of the substance and charges another apprentice with the performing of all the standard tests - acid, fire, crushing, evaporation, washing with oil of vitriol and other acids, incineration and reacting it with known substances. The following day, much wiser and one apprentice shorter, the alchemist concludes that those wedges are made of a heretofore unknown, and incredibly powerful, explosive substance. But this does not make sense at all; why armor the sphere? Why manufacture it with such care? Why connect the wedges with those wires? At this point it is obvious that the thing is not an Alchemical Egg. It is a weapon; logically, it must either be directed against something inside - it was designed to destroy the much smaller sphere in the center - or it was, more likely, designed to direct its force outside. On the other hand, that hellish substance the wedges are made of looks like the weapon to end all weapons all by itself, and it would have been infinitely easier to use alone. No; if someone wants to kill you, has a knife, and yet uses it to do something apparently not murderous instead of just stabbing you, this indicates that the knife is a means to cause something even more lethal to happen. Like cutting a rope and make the victim fall in a chasm, or wounding a dangerous animal to excite it to a killing frenzy. Now dreading what he's going to find, the alchemist removes the last layer. His eyes widen in shock. 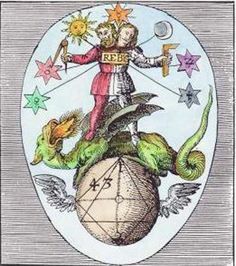 For a moment he thinks that his first theory was spot on: the thing is an Alchemical Egg, as before him there is a perfect sphere of what looks like solid gold, polished to a mirror finish. Unfortunately, the substance can't be gold. It's too light by a good margin. This is delta-phase, gallium-alloyed plutonium, nickel-plated to prevent it from oxidizing and then gold-plated. If the alchemist could remelt it and separate the gallium, the plutonium would cool in the much denser alpha phase, which is a bit denser than gold, and proportionately more likely to go critical with lethal results. Unfortunately for him, removing the gold-plated nickel layer separating the plutonium from air is not a healthy move and he would not survive the melting and its fumes, nor would his apprentices. At this point, actually, he's already a high cancer risk. Also, the golden sphere is warm. Noticeably warm. And he's not so great a fool as to mar the perfection of the mirror - there're many things mirrors can be used for, and inside a sealed sphere, looking at oneself wasn't one of them. All the other uses involve magic, if not Powers that's better not to name. There's a dark spell involving the blood of a virgin and two mirrors facing one another, that can produce infinite reflections of something - like a bag of coins - and make them real and tangible. After several weeks of careful, careful testing, the alchemist comes to the conclusion that the sphere contains some powerful source of energy, likely magic in nature, that keeps the sphere warm no matter what. So: a perfect sphere, plated with gold. And finally the purpose of the assembly is clear: should all the wedges explode - which can only be triggered somehow by those mysterious copper wires, going to small devices attached to the powerful explosive - they would do so inward, directing an unimaginable wave of destruction against the mirror-finished sphere. A concave mirror will concentrate something; a sphere is the exact opposite, a convex mirror that will amplify and spread out the energy it receives. For your reference: some years ago in Brazil a scrap thief, while salvaging through the remnants of a hospital, found a piece of material which emitted a nice glowing blue light. He was smart enough to think "wow, this will make a pretty good gift for my wife", and tried to take it with him. Long story short: 4 dead and various contaminated from a piece of Cesium 137. (Full account of the incident here). And nowadays we have at least seen on TV that glow = radioactive. Renaissance "scientists" had no idea of atoms at all, so the best they could get would be poisoning their entire kingdom with plutonium or uranium for some thousands of years. I admit up front, that my first reaction was to consider the comedy potential of this situation, as the device might have labels on it. That would make a big difference - think of the warnings on a bag of peanuts or a chainsaw, and enjoy imagination ("warning: this product may destroy large cities. ", "user safety information: this product can cause cancers."). Leaving humour aside, more seriously, weapons designers tend to like avoiding stupid user errors from triggering nukes; maybe it would have clear descriptive labels sufficient to explained what it can do, if not how it does it. But as for your scenario, however interesting a plot it would make, the reality is that such a weapon is probably not going to do what you want, and is less useful than you thought, on so many levels. Starting with weapons design, nuclear weapons aren't just a blob of plutonium, they might have extreme precision shaped balanced charges (needed to ensure a hollow sphere fission device collapses perfectly symmetrically which is needed for fission, but which will deform or degrade after not very much time); an undamaged and somehow non-rusty very heavy steel container (to contain the initial blast for the fraction of a second needed to ensure it explodes and doesn't just fragment before significant fission); if plutonium was used it absorbs moisture from air and flakes apart, and if they used any isotope other than Pu-239 it has a relatively short half life in historical terms and will probably be effectively inert as a weapon by now (and other fissible materials may have lost enough through decay to no longer be viable); fusion devices may have materials like polystyrene which can degrade over time, and fragile precision parts calculated in ways they can't hope to intuit, and easy to damage or move even if the device is examined carefully. More seriously, all but the very simplest devices above all will have electronics or computerised control circuitry (to sequence detonation, detect correct impact, altitude, or other conditions met, authenticate the key/s used to authorise settings and activation) and are fail-safe design (designed to make it innately very hard or impossible to explode unless everything is just right) ... and therein lies a problem. Electronics could well degrade in mere decades, due to quantum effects. Metals lose their precision in a similar period, plastics change composition and become brittled, explosives in the trigger can lose their precision. There are questions on this site about how long a plane, or laptop, would work for, if "discovered"; the answers are usually "not that long historically speaking". Basically your nuke might be dangerous as a lump of toxic metal, but I'm dubious whether it would be capable of acting as a functional nuke. You might want to research nuclear weaponry shelf life. Moreover, even if it did, nukes are densely made - think what Ford does under a modern car bonnet, how tightly packed things are. Imagine what a nuke is like, very very densely built and much of it digitally controlled, probably inert unless triggered properly, electronics degraded and inert, no user keys or enabling procedures even if it could somehow work, and when opened, a tight tangled mess of incomprehensible wires and odd shaped materials and some very heavy metal - and those who touch it or inhale dust near it perhaps dying of toxic effects when their hands later wipe their mouth or touch food, even if they somehow don't get radiation poisoning just from being near it. I don't think they have a chance, or indeed that its plausible an old nuke could be identified as anything except a very heavy incomprehensible artifact of which everyone who has touched it dies in a horrible but unnatural manner. That's my best guess scenario. They would have no idea whatsoever about what they were dealing with. None. Zero, nada, zilch. Some time later than the Middle Ages, people would start to recognize the conventional explosives, though the first modern-looking explosives didn't appear until the late 19th century. People wouldn't have a clue what the core was until post WWII. Gun-type fission weapons like the one dropped on Hiroshima. Inside a very strong metal box, explosives are used to fire one piece of metal into a bigger piece of metal. When the two pieces of metal come together, some mysterious force makes them go bang in a really big way, way bigger than the explosives. 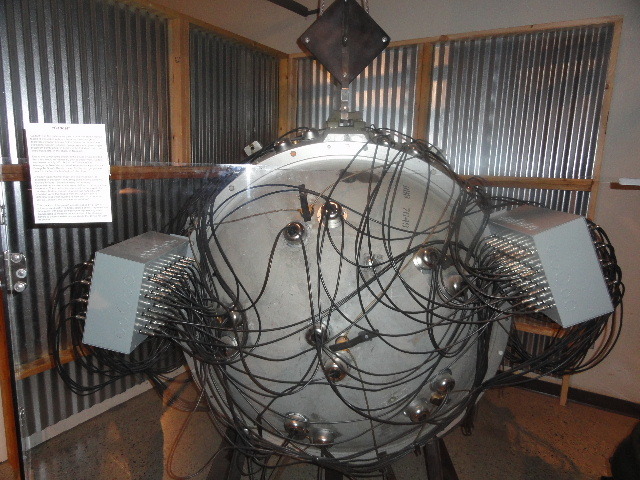 Implosion-type fission weapons like the one dropped on Nagasaki. Inside a very strong metal box, explosives are used to crush a metal sphere (hollow in later designs, with a special kind of air in the centre in even later designs) and the mysterious force does its thing again. Fusion weapons. Inside an extremely strong metal box, an implosion-type fission weapon goes off and then the mysterious force starts acting on another metal box, which then does something with the white (grey?) powder (crystal?) inside that multiplies the mysterious force. But all of this is completely moot. Our mediaeval explorers wouldn't be able to get into the bomb casing because they'd have no way of cutting steel. Even if they could get in, they'd have no way of discovering that the explosives are explosives, even if they were familiar with the concept of explosives from gunpowder. The explosives used in nuclear weapons are extremely insensitive, i.e., they're extremely difficult to set off. If you set fire to them, they'll just burn. In the detonation sequence of the bomb, they're set off by discharging capacitors to put enormous currents through metal wires. Plutonium is just a dense metal. They'd have no idea that a lump of heavy lead could explode hard enough to destroy a city if you did the right thing to it. They'd have no idea that the lump of heavy lead was the thing that made them die of radiation poisoning, or that the plague they died of was radiation poisoning. If they took the thing apart, they wouldn't be able to put it back together accurately enought to make it work again. If they didn't take it apart, the only way they could discover what it was would be by somehow managing to arm and detonate it... and then they wouldn't be in a position to share their discovery. To understand how a nuclear weapon works, they would need an understanding of nuclear physics. That is 20th century science, and even an "inspired" medieval thinker would be unable to get the experimental data to refine this theory. The weapon also contains electronics. Understanding those would require a practical understanding of electricity, not just the concept of electrical power. Again, a medieval scholar couldn't do it, without an across-the-board improvement in the local technology. The nuclear weapon would contain a large amount of conventional explosives. A fictional renaissance chemist/polymath on the way to systematic chemistry might get some pointers towards a better chemical explosive. There are some experiments which give a clue to the nature of molecules and chemical reactions, and that different elements have atomic weight as a multiple of half the weight of hydrogen. It might be possible to determine the elements and their proportions that go into the explosive. They absolutely, postively would not be able to identify it. Not just as a nuclear weapon, but as a weapon in general. You can get around this by having legends of such devices with suitable descriptions. Yes. If you lay the ground for them. Now, it's a mediaeval-ish period, but there are nuclear weapons in the first place. Either these came from "outside" (e.g. from another planet where there was a higher level of technology) or from a more technologically advanced period (or both, as per Sheri S Tepper's True Game series). In a mediaeval-ish period it's perfectly sensible to have a belief in processes that can turn one element (as we understand the term today) into another. This belief is chrysopoeia which was described at least as far back as the classical period, grew in the mediaeval period and through to the early modern period as an essential part of the alchemical Great Work and is still believed in today by some with varying degrees of how much they hold it is literal or symbolic of spiritual change on the one hand and how much they hold it agrees or is unconnected to the current understanding of atomic decay, fission and fusion. Alchemists used a great many strange symbols, some of which survive today with different purposes (e.g. ♀, ♂ and ☿ used in biology were originally used by alchemists as well as astrologers). Modern physics and its related technologies have many strange symbols (try to consider seeing ☢ if you had no knowledge of modern science). An alchemy of a re-mediaeval period—that is, a future period in which technology has ended up at a level similar to that of the mediaeval period—that also worked would likely at least partially retain knowledge from our more technologically advanced time. At first glance (or first description to the reader) it would be much like mediaeval alchemy in combining some genuine understanding of the facts covered by natural sciences, a relatively poor understanding of the scientific method, and a bunch of weird symbols and legends of devices with great power that could transmutate metals. It could though retain enough information of the past for a device to be recognised as one that was in elder times dropped from powerful flying machines and through impure and perverted chrysopoeia bringing a rain of brimstone that felled cities far greater than any known today and a scourge of wormwood that poisoned all the peoples and the beasts in the field for miles around, salting the earth so that even crops could not grow there for many generations. Have a period that was reasonably close to mediaeval. Have nuclear weapons, lying dormant. Have the characters within the story recognise them as incredibly destructive things. Have the reader/audience recognise them as nuclear weapons. Disassembling the device to the point of guaranteeing fatal exposure to all present isn't necessary. (Not least since the idea that its a good idea to try tasting a chemical you think is likely not poisonous and the idea that metals are never poisonous both died out in chemistry more recently than you might think, and so could have returned as investigative procedures for an alchemist). Prof. Dr. Smart Person can totally figure it out. The object is an ancient historical relic from a past culture. A physicist is not the person who should be handling it. Prof. Dr. Smart Person is thus an Archeologist. After lamenting the incalculable damage done to the historical site by the erstwhile looters (but, alas, it is the middle ages: they cannot be arrested for this cause the king likes his shinies), our hero begins painstakingly cataloging all remaining artifacts (e.g. walls, flooring, doors, lighting fixtures) as well as other salient historical information (boot prints in the dust, fingerprints, wear on various surfaces, humidity, air pressure, etc), though most of the latter while have been destroyed by the intrusion of the ignoramuses who pawned off the bomb to the university. Much of this work will be done not by Prof. Dr. Smart Person but by aspiring students and adjunct professors in his service. While our hero is the world authority on technologically advanced ancient civilizations, everyone in the field has their own specialization. An esteemed academic like Prof. Dr. Smart Person has all the best books on the subject, but there's always more to be gained from acquiring more focused texts on the subject. Using (substantial) royal funding, our hero dispatches the university's uniquely skilled Bursar to acquire relevant material from the world over, working together to discern authentic texts from hoaxes looking to make a quick buck. Coordinating his past research with all of the emerging material, Prof. Dr. Smart person comes to the conclusion that this object was, and possibly still is, a weapon of immense power-- so much so that even the ancients feared it's wrath and thousands of time-worn writings in the ancient tongue forswear its usage. The vault into which the looters forced access was an armory of sorts, as can be seen by its architectural and civic similarities to other ancient weapon caches with better-preserved documentation, and this centerpiece of the storage facility matches the scant few extant drawings of the "fire-mushroom weapon" before its use (the "fire-mushroom weapon" is believed to be the weapon forsworn in historical documents mostly by their shared cultural significance in signifying the end of the world and that the same fears seem to apply to both of them). Upon Prof. Dr. Smart Person's report to the king, the sovereign is torn. On the one hand, the weapon represents unlimited military power, and thus further delving into its secrets to unlock its use is very, very tempting. On the other hand, the King was raised with a royal education and is well aware of memorials from the end-days inscribed with such inspiring quotes as "I am become Death, the Destroyer of Worlds -- , upon seeing the first test of the Weapon" and "I am Ozymandias, King of Kings. Look upon my works, ye mighty, and weep!" and "Whosoever shall make use of the Weapon, let him be anathema", etc. Perhaps some secrets are best left unknown. In any case, the king must now decide what to do with the last remaining fire-mushroom Weapon (Order Prof. Dr. Smart Person to research methods of destruction for the artifact? Order the University to unlock its full potential? Order it sealed away in the Royal dungeons for someone else to decide what to do with?). If they go further into the research, the next step would be to excavate the surrounding area to the original find in search of further information. It is definitely reasonably possible for them to ascertain the use and operation of the missile. Of course, the missile is no longer 'nuclear'-- the past millennia have certainly reduced its radioactivity significantly and it's likely no longer capable of a full-scale detonation. If the cache had some sort of preservation method in place, then this is not a problem and the missile can be launched if a launching place can be found to launch it and its security can be bypassed (both unlikely). But in any case, they can totally figure out what it does. You mentioned fantasy, which I assume includes magic, so I will use that. If this works or not depends on the magic available. If you've got some kind of almost reliable Divination magic then use it on this. A good diviner might cast spells, or pray, or whatever he does, and get a dream, which would show the effect. If he gets a good view he can see this is a weapon that can destroy large cities. If he can imagine doing various actions and determine what would result, then he can learn a lot about it. The bomb is probably not functional if it has just been sitting around. However, he should get plenty of visions about the death and sickness caused by opening the bomb and poking at the Uranium or Plutonium inside. All of this spell casting would probably take months. In the meantime the curious alchemist has probably already opened it. For a 'simple' bomb, if they disassembled it and experimented with its pieces, they might notice that if they put some of the pieces in close proximity, it results in criticality, causing a noticeable release of energy. They might also learn to associate subsequent radiation sickness with the incident(s). The only way I can think they would recognize it as a bomb is if a similar bomb were found at one point, news of the finding spread, then it subsequently was set off by mistake. If the descriptions match the old stories of the cursed artifact that consumed an entire city in hellfire and left behind a plague of sickness, it's plausible they would treat it as a weapon. The more likely drama is a criticality accident. First, he'll never figure it out. I consider LSerni's scenario highly improbable. The gadget contains just a bunch of complicated gobbledygook, too inaccessible to anyone without at least 19th century sensibilities. He'd be worse off than a cargo-cult. I don't consider an accident with the explosives likely, because they are the best insensitive explosives money can buy. But even that would only amount to the Kidman-Clooney example. Even in that case, the Pu239 dust would not kill enough people fast enough to be distinguished from the normal dying of the middle ages. Far more likely he just reduces it to a pile of parts, is either stumped or wrecks it, and never figures out the core is special other than being uncharacteristically warm. Unless he dissolves the core in acid (e.g. Aqua regia). Then it could very easily go critical in the jar because of the moderating water. It could go critical a year later as water slowly evaporates and the solution thickens. By "critical" I mean the nuclear chain reaction starts and sustains, much as it does in a power plant, presumably at a low level. It would give a blue glow and a lot of radiation and heat, people close to it would die in a week. Oh, wait. They have two. And he's taken two of them apart all the way down to the oddly warm core. And he does what humans do with like things: puts them together. What happens next depends on the physics. Could be nothing. Could be the mass becomes critical, ramping up power until the forces push the cores apart. The lethality of that depends on how hard that is. In the Slotin accident, they stacked the deck against themselves by not making it easy for the criticality to disassemble itself. Our alchemist could be a great deal luckier; e.g. if one is in his hand and the unnatural effects startle him into dropping it, he might get away with it (long as he doesn't keep trying it). If he's set them both in a tight fitting wooden crate, they won't quit until they burn through the box. Eventually the energy will force the two cores apart, ending the criticality. There's more. Water increases criticality. The pair might become critical only when immersed in water. Maybe it rains. Maybe the alchemist has them nestled in a wooden box, and the unnerved wife or king decides to be rid of them and throws the box in the river. Bad plan. But that will still increase energy until the cores are forced apart -- right? Not necessarily. Near-magic could happen: Water removes heat quite efficiently - and if it makes enough heat to boil the water, the steam bubbles displace water. Steam isn't water and this reduces the criticality, throttling the reaction until the steam bubbles fade and the reaction throttles up again. Meet negative void coefficient of reactivity. A modern reactor is designed to use this as an automatic, passive throttle - set the control rods in the right neighborhood and the reactor will trim itself**. Depending on how the physics work out, that pair of cores could make heat for a really long time. Little Boy and a few other early experiments were a type that simply mashed two chunks of metal together into a critical mass. Nobody makes them because they have so many problems: e.g. they can go off by accident. That could vaporize your entire stockpile, unless you want to store each weapon 5 miles apart, but then how do you guard them all? So the alchemist will never get one; they aren't made. The modern types require a flawless sequencing method - that's how Nicole Kidman made the weapon fail in the above clip. That is computerized and easy to tie into sophisticated authorization systems. What's more, America gives the tech away for free to any state we think might have nuclear weapons. Nobody's gonna put a user-friendly UI on a nuke - that would go against the entire concept of non-proliferation. ** This coefficient void in Russia and Canada. RBMK and CanDU reactors have positive void coefficients - boiling increases their power. That ain't good. It may depend on the sophistication of your audience. If your audience will probably understand the basic principles behind an atomic bomb, they will laugh at the idea. But if they are not that sophisticated, they won't understand atomic principles, and it might seem plausible to them that "some really smart medieval scientist" could figure it out. There was also a "Wild Wild West" episode (http://www.imdb.com/title/tt0080132/plotsummary?ref_=tt_ov_pl) where the evil Dr. Michelito Loveless, Jr. creates an atomic bomb roughly a half-century before its time. This is not as far-fetched as the middle-ages, but it shows that audiences will be willing to suspend their disbelief if (1) the implausible act isn't belabored; and (2) they don't know that much about the science to appreciate the implausibility. Finally, if an atomic bomb could (somehow) make it to this world, is it that implausible that documentation or some mythology of atomic bomb theory could also make it to this world through similar mechanisms? That might be enough for a learned member of society to at least have a suspicion about what it might be. I'm not saying this means someone could've figured out what a nuke was by examining and disassembling one...just that a well-read scholar MIGHT have knowledge of some of the things needed to conceptualize what it was for. Maybe they atom bomb power was witnessed by the ones who put it in the hidden dungeon. This could create religion, like in Megaton in Fallout, so the crypt would be full of mitologised descriptions of power of the bomb, maybe even with an ancient scroll with launch codes. The biggest item catches their attention most. What else is in the cache? It could contain some items that provide cryptic information about events from another world. With this, the alchemist might be able to connect some dots and figure out what this big device was supposed to do. Arguably, whether on not they assume it's a weapon or not is less a matter of technology, and more a matter of psychology. If they are highly militarized and aggressive, then they may be inclined to see any strange object as a weapon or potential weapon. Admittedly, their best idea of how to use it would probably just be to load it in a catapult and fling it at someone, but really, is that so far off? If they managed to remove some of the protective shielding first, it might even be highly effective, even if it never actually exploded. It's fun to think a bit of the opposite scenario as well. Would a deeply peaceful future society correctly identify this as a weapon, even given their advanced technology, if the entire concept of weapons has disappeared out of the collective consciousness? He tries the first thing that any medivial scientist do. Yes, he'll try the most magical, sciency thing at his disposal and one of the most common things to experiment with, fire. When the thing will not be affected by a small wick, he'll try putting it in a larger bonfire and when that doesn't work he'll try to burn it at the stake and THEN he'll level the city. In the end, all thats left would be rumors of adventurers finding a "cursed" artifact which caused not only the death and destruction of many but made a populous utopia into a inhabitable wasteland. Also, god knows how unstable an old nuclear bomb can be, if not highly hazardous. Maybe it might be the opposite, maybe its been out for so long, its decayed into nothing. Why? Because you do not understand formatting. Formatting means, "arrange or put into a format. ", not change the original content or change the meaning in original content. So in a way you are defacing posts.. hence I feel you should be permanently banned. The person before you did a good job of formatting, maybe you could learn from them. Not the answer you're looking for? Browse other questions tagged medieval science middle-ages renaissance nuclear-weapons or ask your own question. How can I estimate how many people are living in a specific territory? Would the capability for Japan to drop a nuclear bomb on the USA have deterred the USA from dropping a nuclear bomb on Japan? Could a classical era or middle ages civilization advance in shipbuilding and colonize multiple distant continents?